Nuffield 10/42 Tractor Dash Parts and Nuffield 10/60 Tractor Dash Parts. Are you looking to refresh or repair your dash panel on a Nuffield 10/42 or a Nuffield 10/60? All these parts and more have been added to the website this week! All parts are available from stock. 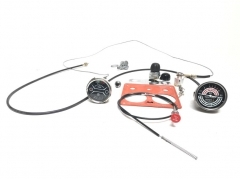 ATJ8515 DUAL OIL AND TEMPERATURE GAUGE £30.00 - ATJ8512 GENUINE SMITHS TACHOMETER CLOCK £126.58 - ATJ8516 FRONT PANEL £52.00 - ATJ8517 CHROME FASCIA £11.50 - PMZ408 PANEL SCREW £0.29 - BMK1094 IGNITION SWITCH £17.85 - 24G1345 KEY & BARREL £6.50 - 13H1694 SOCKET £37.83 - 37H2923 LIGHT SWITCH £15.16 - 27H3699 KNOB £6.23 - ATJ2068 PLATE £15.29 - ATJ3113 STOP CABLE £17.89 - ATJ3067 RETURN SPRING £2.95 - NT8373 DRIVE UNIT £19.50 - ATJ8544 10/42 TACHO DRIVE CABLE £25.00 - ATJ8543 10/60 TACHO CABLE £25.00. All prices are correct at time of posting but may be subject to change.